Difficult as it is to imagine today, the New York metropolitan area was once home to a broad array of incredibly diverse plant communities. Much of Brooklyn was old-growth oak forest; the New Jersey Meadowlands were cedar swamps and sphagnum bogs; the eastern part of Long Island was a rolling, tallgrass prairie; and the wetlands now occupied by JFK International Airport were filled with beautiful orchids. These ecosystems have been nearly wiped out by urban development, but a stroll through BBG’s newly expanded Native Flora Garden provides a glimpse of the natural world that existed here hundreds of years ago. “This is more than just a pretty place. The plant collection is truly local, so people can understand the beauty, the diversity of the native plant communities that once existed here and a few that still do exist very nearby,” says esteemed landscape architect Darrel Morrison, who headed up the Native Flora Garden expansion. The expanded garden features a cultivated pine barrens and a meadow modeled after small, extant natural ones nearby. Altogether, 150 native species are included, many of them rare or threatened and most propagated from seeds collected from the wild by BBG experts. Not only does the garden serve as an exhibit for the public, it is also a place to grow specimens for research and conservation. This expansion comes a century after BBG first established the Native Flora Section, as the garden was then called. The original design featured a woodland and separate wildflower beds, arranged in a systematic grid so that scientists could easily observe and access the plants for research. Those plots were redesigned in 1931 into an ecologically based arrangement that allowed visitors to observe native species growing in plant communities as they would in nature—a garden design concept revolutionary for its time. Today the original two-acre space has matured into a small forest of century-old oak, maple, and tupelo trees, some of which are more than 100 feet high. Though it makes for an authentic re-creation of a natural forest, the mature tree canopy has shaded out plant communities that require a lot of sunlight. The new expansion provides a sunny space for these important species to thrive. Morrison, best known for his expansive designs using native prairie grasses, described the project as a great opportunity to design a garden that allows visitors to take in a wide diversity of plant communities in a small space and to see re-creations of the successional transitions that occur in nature. “As you move from the existing, wooded area, you’ll pass through a grove of birches that will act as a woodland edge, and the light continuum and the moisture continuum will change and give way. You will really see and feel it open onto the sun-loving garden area,” he says. Along the winding footpath and boardwalk, on the east-facing slope, visitors walk through a replicated pine barrens, an unusual plant community that evolved in the acidic, sandy soil that covers parts of New Jersey and Long Island. Pitch pines and scrub oaks dot the upper reaches of the garden, and eventually they will mature into a small forest. Other plantings include blueberry, sheep laurel, and most notably, pixie-moss, a rare and threatened species of flowering evergreen groundcover for which BBG serves as an official custodian. Just beyond, a small stand of Atlantic white cedar and a freshwater bog represent a typical lowland pine barrens plant community. The water’s edge is home to sun-loving carnivorous pitcher plants and sundews, orchids, sphagnum moss, and yellow-flowered bog-asphodel, another rare and threatened species. On the west side of the path, visitors will see a sloping meadow inspired by the Hempstead Plains, a tallgrass prairie that once covered a large part of Nassau County. Drifts of grasses and herbs including big bluestem, orange-flowered butterfly weed, blue wild lupine, and purple showy aster create a wash of color that changes with the seasons. Near the top of the slope, a small cluster of greenish-gray rocks represents a serpentine outcrop like those found in parts of Staten Island. These unusual, mineral-rich rocks change the character of the surrounding soil, making it very high in magnesium and low in calcium. The plants that grow in it, like whorled milkweed and eastern shooting star, must be very resilient; a sample community has been planted here. Like the rest of the Native Flora Garden, the expansion is a place not only to enjoy but also to connect with and learn about local plants at a time when they are increasingly threatened in the wild. As the garden establishes itself over time, return to watch the specimens mature and adapt to their new home. This special place will be a refuge for the plants that grow here and for the people who visit them for many years to come. 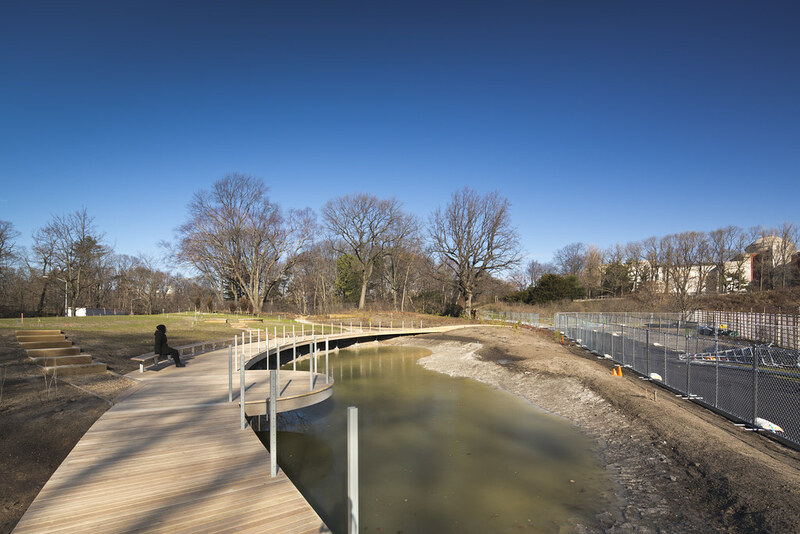 The Native Flora Garden expansion at Brooklyn Botanic Garden, currently under construction, will feature a cultivated pine barrens and a meadow modeled after small, extant natural ones nearby. Photo by Albert Vecerka/Esto.